FAIRFAX, Virginia - Who gave you your first knife? Well, if you’re like many of us, it was your father. And if your father was like mine, he also taught you the safety and responsibility of carrying a knife. With that knife, you may have learned the art of whittling or how to harvest a deer – lifelong lessons that we still use today. A true American who preaches self-reliance, love for his country, and the Second Amendment is one who personifies the NRA lifestyle. This Father’s Day, show your dad how he helped shape you into a freedom-loving patriot, with our NRA Family Tradition Knife Set. This knife set takes the tradition of a boy’s first knife to the next level. With three photo slots on the left, center and right of the case, personalization is made that much easier. Dad’s picture has a place right below his knife – a 3½” double-blade Barlow. Junior’s knife, the single blade cousin to Dad’s, is above his photo. With Blond and green curly maple handles on alternating sides of each, both father and son has a piece of the other’s knife with them at all times. Solid walnut presentation case comes complete with hooks for wall-hanging, and two 1-3/8” brass NRA lapel pins are included. 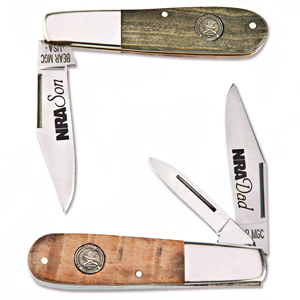 The NRA Family Tradition Knife Set is 100% made in the USA and is an NRAstore exclusive. See this one-of-a kind collectible and many other NRA products at NRAstore.com. And while you’re there, remember that 100% of NRAstore profits directly support vital NRA programs. You can request a free catalog, too!